A day at the amusement park can’t get much better – unless each ride transports you to Santa’s magical world! 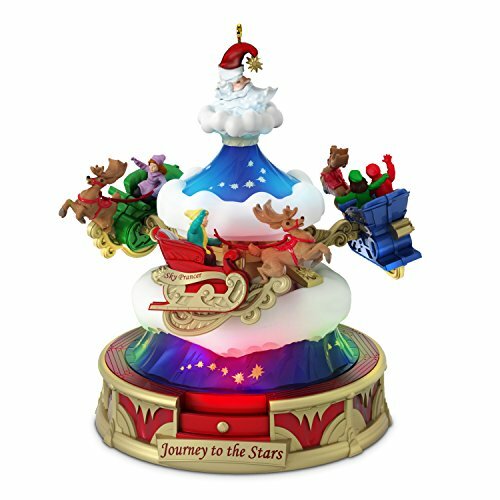 This first ornament in the new Christmas Carnival collector’s series features a sleigh ride like no other, with three reindeer-drawn sleighs (named “Comet Chaser,” “Star Dancer” and “Sky Prancer”) spinning around a starry sky with fluffy white clouds. Connect the Christmas Tree ornament to Hallmark’s Keepsake Power Cord (sold separately) to see a continuous light and motion effect, and press the button to hear it play music from “Jingle Bells.” Connect other Christmas Carnival Storyteller ornaments, each sold separately, to unlock additional amazing interactive performances. No batteries necessary. Christmas tree ornament is first in the Christmas Carnival collector’s series. Storyteller Interactive Sound, Light and Motion Christmas tree ornament. Connect this ornament to Hallmark’s Keepsake Power Cord to see the continuous light and motion effect. Press the button to watch it perform a happy holiday tune; plays music from “Jingle Bells.” Requires Hallmark’s Keepsake Power Cord (sold separately). No batteries necessary. Artist crafted by Ken Crow, this Christmas tree ornament comes pre-packaged in a box for easy gift giving, preservation and storage. Dated 2018 in copyright. Each ornament in this new, five-part series will feature a fun and festive amusement park ride. Collect all five Christmas Carnival ornaments, each sold separately, to complete the series and unlock additional interactive performances. One Keepsake Power Cord powers up to 7 Storyteller Ornaments. With unparalleled artistry and exceptional detail, each festive and collectible Keepsake Ornament is made for years of celebrations. From preserving precious memories to commemorating special milestones and interests, there’s a Hallmark ornament for everyone on your gift list. Hallmark has been your family-owned creator of greeting cards, gifts, gift wrap, ornaments and more for over 100 years. We take deep pride in helping individuals connect in just the right way. Plastic Christmas tree ornament is lead-free and measures 4.4″ W x 5″ H x 4.4″ D.
Christmas tree ornament is first in the Christmas Carnival collector’s series. Storyteller Interactive Sound, Light and Motion Christmas tree ornament. Connect this ornament to Hallmark’s Keepsake Power Cord to see the continuous light and motion effect. Press the button to watch it perform a happy holiday tune; plays music from “Jingle Bells.” Requires Hallmark’s Keepsake Power Cord (sold separately). No batteries necessary. Each ornament in this new, five-part series will feature a fun and festive amusement park ride. Collect all five Christmas Carnival ornaments, each sold separately, to complete the series and unlock additional interactive performances. One Keepsake Power Cord powers up to 7 Storyteller Ornaments. Plastic Christmas tree ornament is lead-free and measures 4.4″ W x 5″ H x 4.4″ D.